Will Sidney Crosby and Evgeni Malkin be healthy enough to return to form and lead Pittsburgh? The injury to Sidney Crosby and the loss of Evgeni Malkin were supposed to cripple the Penguins. Instead, they showed that they are more than a two-man team. Their role players stepped up in a big way, leading them to the playoffs in strong position, where they came up short against the Tampa Bay Lightning. Obviously the big question heading into this year surrounds the health of Sidney Crosby. At this point, it’s unknown if he’ll be ready and just how healthy he’ll be to begin the year. 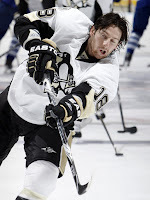 For now, expect Evgeni Malkin to set up James Neal quite a bit, and for the rest of the Pens to produce plenty. Over the course of the year, the Pens will compete for the division title, with Philadelphia is a state of flux. Their main competition will likely come from the re-vamped Buffalo Sabres, or the modestly improved New York Rangers. On the whole, expect the Pens to receive quality goaltending and play a gritty game. They’ll make the playoffs and may even win the division. Forwards Pittsburgh’s line combinations appear to be fairly up in the air so long as Crosby’s status is uncertain. 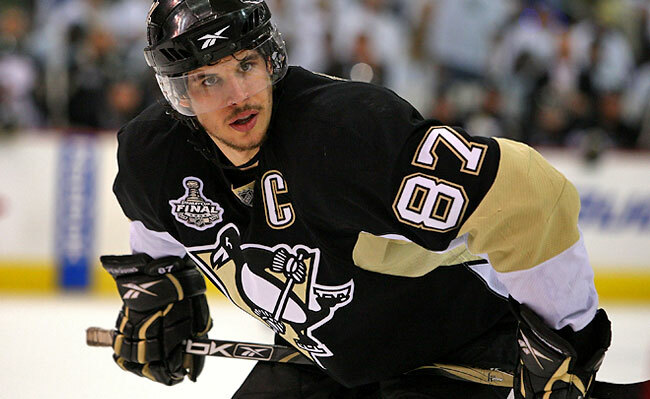 The biggest question mark for any team entering this season: Will Sid the Kid be ready? All signs point to no. Gamble on Crosby in later rounds if you like, but go with a better bet for 100 points—Ovechkin or a Sedin twin. Evgeni Malkin Malkin also suffered a serious injury last year and will be looking to rebound from a disappointing season. He could return to 90 point form, and would likely be helped by a healthy Crosby to share the workload. Malkin could be a sleeper, as he may not be drafted among the league’s super elite. James Neal Neal turned a lot of heads in Dallas before being dealt to Pittsburgh. While he struggled with the Penguins after the deal, he is the winger that Crosby and Malkin have sought for a few years now. Big, fast, and boasting a good shot, the young forward is bound for a breakout this year. Expect big things. Jordan Staal Staal missed the first half of the season recovering from an injury, but was thrust into a larger role than usual upon his return. His pace last season would place him at about 60 points. It’s possible for him to hit that this year, but if Crosby is healthy, expect a modest decline to 50-55. Chris Kunitz Kunitz is a reliable and pugnacious winger who is capable of producing offense. A terrific complimentary player for Crosby and Malkin, he’s capable of 20 goals, 40-50 points and a lot of hits. There is not much upward potential here, but he’s a lock for some modest point totals. Steve Sullivan The diminutive forward has been held back by injuries lately, but still possesses solid skill and scoring ability. Sullivan is a bit risky with his age and injury concerns, but a late round gamble on him could pay off quite well. Pascal Dupuis Dupuis is a tenacious forward who is good on the penalty kill. Not much more upside than the 37 points he tallied last year. 35 points is about what Dupuis is good for. Kris Letang Letang was a bit of a disappointment offensively two years ago, but exploded last year and helped fans forget about Sergei Gonchar quite quickly. He tallied 50 points last year and played a very solid all-around game. Expecting more of the same this year, select Letang quite high amongst defenders, and watch the points roll in. Paul Martin Martin averaged over 23 minutes a night last year for the Pens and registered 24 points. There is more offense to be had, and this year should see a modest boost in his numbers. Expect 30-35 points this year from the American. Marc-Andre Fleury Fleury’s 36 wins last year and 2.32 GAA under score how valuable he was to the Penguins. He’s one of the league’s top 10 goaltenders and is capable of even more. With a hardworking team in front of him, Fleury’s numbers will continue to be strong. Expect a lot of wins and some strong shutout numbers as well. Brent Johnson Johnson produced very solid numbers for a back-up, numbers that don’t include a big knockout of Islanders’ goaltender Rick DiPietro. A tremendous season for a back up, Johnson is good, but may be hard pressed to match those statistics. Malkin will obviously be on fantasy owners’ radar, but perhaps not as high as he should be. Consider selecting him after Ovechkin and the Sedin twins, while other owners may draft the likes of Steven Stamkos, Martin St. Louis, Sidney Crosby and Joe Thornton first. Malkin is a top flight talent but has been over-shadowed by Crosby and his own injury troubles last season. Expect a rebound and some healthy point totals. Tangradi only had 3 points in 15 games, but his tremendous size (6’4”, 221lbs) is attractive on a team filled with wingers that do not hit the 6’ bar. If Tangradi can stick with the big club and work his way into a top 6 or top 9 role, he could produce some dividends for those owners who took a chance on him. There are better prospects out there, but he stands a decent chance on the Penguins. 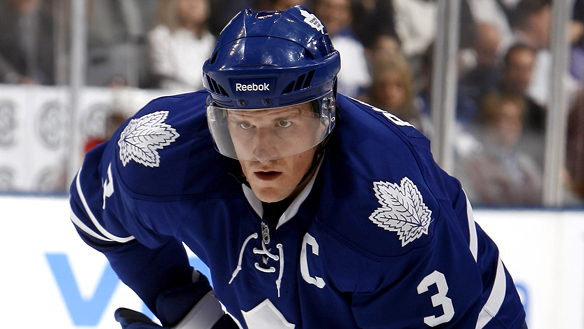 With a talented centerman, Neal could reach the 30 goal plateau. Neal displayed great potential in Dallas, and despite scoring only 1 goal in 20 games in Pittsburgh late last year, he should rebound and add to his totals last season. 22 goals and 45 points in 75 games is a solid season for most, but we think Neal has more to give. Expect 60 points and 30 goals from Neal. He’ll get ice time before most of Pittsburgh’s wingers, and on a team laden with talent, he should prosper and realize his potential.